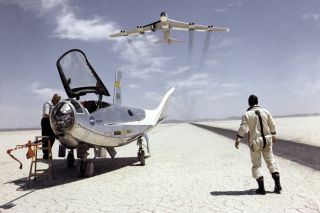 NASA research pilot Bill Dana watchs the NB-52B fly over after a 1969 test flight in the HL-10. In this historical photo from the U.S. space agency, NASA research pilot Bill Dana takes a moment to watch NASA's NB-52B cruise overhead after a research flight in the HL-10. On the left, John Reeves can be seen at the cockpit of the lifting body. The HL-10 was one of five lifting body designs flown at NASA's Dryden Flight Research Center, Edwards, California, from July 1966 to November 1975 to study and validate the concept of safely maneuvering and landing a low lift-over-drag vehicle designed for reentry from space. Northrop Corporation built the HL-10 and M2-F2, the first two of the fleet of "heavy" lifting bodies flown by NASA. The contract for construction of the HL-10 and the M2-F2 was $1.8 million. "HL" stands for horizontal landing, and "10" refers to the tenth design studied by engineers at NASA's Langley Research Center, Hampton, Va.
After delivery to NASA in January 1966, the HL-10 made its first flight on December 22, 1966, with research pilot Bruce Peterson in the cockpit. Although an XLR-11 vehicle, the first 11 drop flights from the B-52 launch aircraft were powerless glide flights to assess handling qualities, stability, and control. In the end, the HL-10 was judged to be the best handling of the three original heavy- weight lifting bodies (M2-F2/F3, HL-10, X-24A). The HL-10 was flown 37 times during the lifting body research program and logged the highest altitude and fastest speed in the Lifting Body program. On February 18, 1970, Air Force test pilot Peter Hoag piloted the HL-10 to Mach 1.86 (1,228 mph). Nine days later, NASA pilot Bill Dana flew the vehicle to 90,030 feet, which became the highest altitude reached in the program. Some new and different lessons were learned through the successful flight testing of the HL-10.